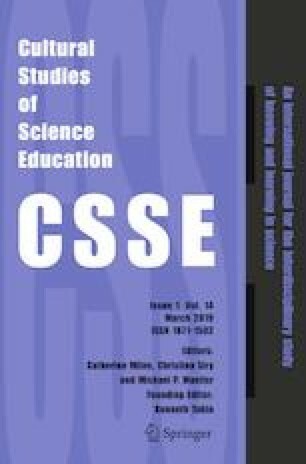 This paper explores the ways learners respond to and express themselves while interacting with cultural artifacts or cultural realia, beads and beadwork, used to mediate the teaching and learning of life science concepts in a science classroom. South African policies, enacted in the National Curriculum Statement (NCS) and the Curriculum and Assessment Policy Statement (CAPS), mandate that a culturally responsive pedagogy be used to teach indigenous learners in order to assist them in learning science concepts. Hence, the choice of beads and beadwork, which are cultural artifacts found in learners lived world as realia, creating an enabling context accessible to teachers and learners. This study was conducted in periurban Black township schools near a metropolitan city in South Africa. In order to achieve a thick description (Geertz in The interpretation of cultures, Basic Books Publishers, New York, 1973) of class interactions between the teacher and her learners in using cultural artifacts, beads and beadwork, as instructional models to mediate the teaching and learning of abstract structures of organic compounds, such as glucose, fructose, lipids and proteins, were enacted and video-recorded. Video analysis of class interactions and teachers’ professional development was employed. We also engaged open-ended questionnaires to extract learners’ basic views of the use of beads and beadwork as instructional models. Findings indicated that the use of beads and beadwork as instructional models afforded learners a context that enabled them to express and expand their cognitive constructs of what learning science from cultural perspectives looks and feels like. It also showed that learners’ capitals, namely cultural, social and symbolic capitals, enhance the development of cognitive capital leading to the emergence of more knowledgeable other(s) within indigenous science classrooms. Findings also showed that cultural artifacts enabled the restructuring of the teachers’ pedagogical practices toward enhancing learner’s know-how of science concepts in the classroom. Recommendations necessitate the use of cultural artifacts or cultural realia as culturally related instructional models—CRIMs—to teach and learn abstract science concepts. This approach tends to bring science closer to the indigenous learners’ consciousness, thereby enabling more familiarity with concrete or abstract science concepts. Eventually, the goal of helping learners to learn science concepts effectively stems from the standpoint of learners being active rather than being passive participants in the teaching and learning process. Lead Editor: Alejandro J. Gallard M.
Baltzer, S. (2013). Kids’ room color wisdom: How colors affect behavior. Retrieved from https://www.houzz.com/ideabooks/16866284/list/kids-room-color-wisdom-how-colors-affect-behavior. Retrieved 4 January 2017. Curriculum Assessment Policy Statements (CAPS). (2011). Retrieved from http://www.education.gov.za/Curriculum/CurriculumAssessmentPolicyStatements(CAPS).aspx). Retrieved 10 September 2015. NCS. (2011). National curriculum statements (NCS) grades R—12. Retrieved from https://www.education.gov.za/Curriculum/NationalCurriculumStatementsGradesR-12.aspx. Retrieved 10 September 2015.